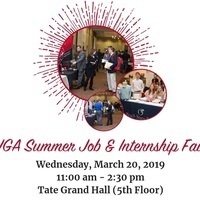 Employers from Atlanta, Athens and summer camps from across the southeast will be hiring students for internships and summer jobs. This will be a great chance to meet representatives from a wide range of employers for that perfect summer job or internship. 1. Bring copies of your resume. Make sure you've had it critiqued at the Career Center Drop-in hours, M-F, noon-2 p.m. in Clark Howell Hall, 2nd floor. 3. Smile, make eye contact and introduces yourself to representatives. Work on a career fair pitch to stand out. Check out page 16 in our Career Guide for examples.